England captain Chris Robshaw says his Harlequins team-mate Nick Easter is "getting better with age". Easter, 36, was named man of the match as Quins beat Leinster 24-18 in the European Champions Cup on Sunday. When asked if he considered Easter still to be one of the best number eights in the country, Robshaw said: "Yes he is. He's a great player, and he's a great man to have alongside you. "He's a terrific ball player and he seems to be getting better with age." 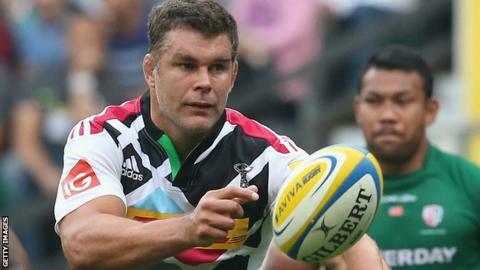 Easter won the last of his 47 caps for England in 2011 and has not featured under current head coach Stuart Lancaster, but Quins director of rugby Conor O'Shea says the forward is still good enough to play at international level. "I've always said he can still play for England," said O'Shea. "He's at the tail-end of his career, but he's still got a few more years left in him." Harlequins now lead Pool Two with 12 points, three ahead of Irish side Leinster and four points clear of English rivals Wasps. Robshaw, who was replaced as Quins skipper by prop Joe Marler in the summer, led the side out at the Stoop on his 200th club appearance, which came after four consecutive weekends captaining England in the autumn internationals at Twickenham. "Conor is extremely good and extremely smart at looking after the guys," the 28-year-old flanker told BBC Radio 5 live. "Coming back to the club, a lot of questions were asked about if we were ready and mentally fit, but these are the games you want to be out there playing and you don't want to be sat in the stands. "I'm extremely honoured to have come through the academy, and I've been privileged to captain [the club] and pick up some silverware along the line. "I've known and played with my team-mates for 10-plus years. It was a special day."